The world of gardening is open to anyone at any time. If you haven't had the chance to explore this wonderful hobby, then an exciting adventure could be waiting for you. Gardening is good for both physical and mental wellbeing. Even if you can only make a small commitment, you’ll be surprised at what you can achieve. You may even be able to bring a touch of the Garden of Eden to your corner of the world! Why is gardening good for you? It’s a fun form of physical exercise which can improve mobility and flexibility. It can improve strength and stamina by building muscle mass in the body. It can help prevent diseases (like osteoporosis) and lower blood pressure and cholesterol. It can boost your mood by releasing endorphins—the body’s own natural feel-good hormone. It can be a great way to meet people at a gardening club or community allotment. It can produce healthy, home-grown produce. Regular gardening can help bring a new structure to your life, but you can still work at your own pace and in small steps, doing as much or as little as you like. Tending plants can give you a meaningful sense of purpose; bringing life into the world, nurturing it and watching it grow can be a rewarding process. Indoor plants can afford to be more delicate as they won’t need to survive any severe weather elements like outdoor plants would. You can control the temperature of your home and keep nasty pests from attacking the fruits of your labour! One issue you might find with indoor gardening is a possible lack of natural light. A sunny window can be a good place to keep plants. Indoor growing lamps are also for sale in a wide price range. Another issue could be space. It’s easy to forget that plants like to grow. It’s important to consider this when looking into your options. You probably won’t want your potted plant to go from a pretty feature in the corner into a huge monstrosity that takes over the whole room! Floral: orchids, hibiscus, lilies, cacti, geraniums, begonias. Edible: most herbs, from oregano to chives or mint; cress, tomatoes, lemons. When thinking about outdoor options, it’s really important that you do your research into how much labour is required to ensure that your plants flourish. If you’ve only got a little time to spend maintaining your garden, there are many options still available to you. Floral: bulbs (such as daffodils or tulips), heather, sunflowers, marigolds (these can be eaten too!) and hydrangeas. Edible: herbs from rosemary to basil, thyme and parsley; fruits such as apples, pears or strawberries; vegetables such as lettuce, cucumbers, carrots…it is endless! Fragrant: honeysuckle, roses, sweet peas, lily-of-the-valley, lilac. TIP: Before getting started, it’s a good idea to ask for friendly advice on what to buy and whether your environment is right for what you want to achieve. You can do this by popping into your local garden centre or visiting the gardening section of your local library or bookshop. Wear protective clothing. Always use gloves for both indoor and outdoor work, and when you're outdoors, make sure to wear comfortable and protective shoes. In hot weather, wear a hat (to block the sun on your face) and lightweight clothing (to protect any exposed skin)...and don't forget the sunscreen! Keep hydrated outdoors, especially in warm summer months. Drink water or juice and avoid alcohol. Gardening can be hard work, so before getting stuck in, do some gentle stretches to loosen and warm up your limbs and muscles. Remember to take frequent breaks as well, and don’t work in direct sunlight for long periods. Take care on slippery surfaces and step ladders if tending to hard-to-reach plants in hanging baskets or on shelves. If you are spending a lot of time kneeling on the ground, think about placing a cushion under your knees to make yourself more comfortable. Likewise, if you sit at a table, make sure it is stable and your chair is comfortable. You can avoid straining by putting your chair at the correct height. When possible, use lightweight tools that are easier to handle. Make sure there is a tap nearby for filling watering containers, washing tools, etc. Otherwise, you’ll use up a lot of energy every time you need to get water. If bending and stooping is an issue, consider placing plant pots on higher surfaces like gardening benches. It’s also possible to raise flowerbeds; contact your local garden centre for more information on options in your outdoor space. Use wheelbarrows, trolleys and other aids to make it easier to move items around. And most importantly, accept help when you need it. Friends and family members can make great gardening assistants, and gardening can be a wonderful way to spend time together. If you're interested in developing your green fingers, we've gathered together some resources to get you started. Royal Horticultural Society Advice includes useful tips on everything from pruning trees to growing your own fruits and vegetables. Gardeners’ World's "no fuss guide" for new gardeners offers straightforward self-help on everything from ordering seeds to testing your soil texture. Age UK's Gardening tips and advice from Christine Walkden are presented in an audio format. Carry on Gardening's top tips for disabled gardeners offers detailed advice focusing on specific issues. Amateur Gardening features simple suggestions about planting, growing fruit and vegetables or even bringing more wildlife to your outdoor space. House & Garden Outdoor Spaces gives a glimpse of some examples of gardening at its very best. This website is more for inspiration, but it’s a lovely place to visit. Saga Gardening includes a selection of gardening ideas on everything from positioning bird boxes to growing cherries! 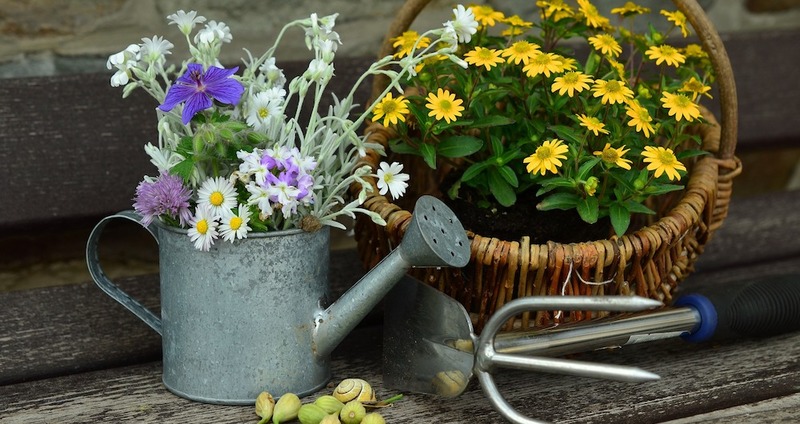 The British Heart Foundation's Activity gardening section looks at how to continue enjoying this hobby despite living with heart-related ailments. Get Busy Gardening “DIY for the beginner on a budget” offers good ideas for those who are new to gardening. Fennel & Fern is lovely to look at and has some interesting articles too. Garden Therapy combines DIY Garden Projects, Recipes & Crafty Goodness in a wide variety of activities ranging from potting plants to making your own natural soap; there are recipes to make from your home-grown produce! One way to learn the basics of gardening is to join a local project as a volunteer. Not only will you be giving back to your community by offering your time, but you will pick up lots of great advice along the way. You can even make some good friends in the process. Take a look online and ask at your local community centres about what projects may be going on in your area. The National Trust Volunteer programme has opportunities in very special places all around the country. The Federation of City Farms and Community Gardens connects you to local gardening and farming projects. London’s Royal Parks Volunteering Opportunities include anything from garden conservation to wildlife habitat management. Local bookshops and libraries can also be great places to find information on gardening, but some branches will do this better than others. Finally, don’t forget to visit your local garden centre for practical advice on gardening. These are good places to get help, as you can actually speak to a real person!